Caravan Clubs: Practical Motorhome - find the right caravan club for you. Practical Motorhome magazine has never quite made it in the motohome market in the way that Practical Caravan has in the caravan one. Nevertheless it is an excellent read and the web site is a good companion to the magazine although currently does not look like the editorial team put the same effort into the site as they do the paper magazine. 1 Practical travellers – we all have experiences to share and a tale to tell. We can help you tell others your stories. 2 No mugs when it comes to money – we all want the best deals, on everything from new ‘vans to great sites. We will help you find them. 3 Proud of our ‘vans. We’ll show you how to love your ‘van with a bit of maintenance, so it will love you back with the best holidays of your life. 4 A Practical Community. 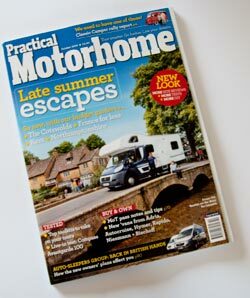 Look for this sign (below) in the magazine to find the best advice for motorhome users, from motorhome users.